AlphaZero, now peer-reviewed and working across three different board games, showcases the flexibility of deep reinforcement learning. We have been building models to follow historical trends and make predictions on what will happen based on past data. Now, we have machines that can observe the environment, learn the “unspoken rules” of the environment and adapt its actions to explore & exploit the environment like a human; just don’t hold your breath for artificial general intelligence (yet). AI in 2018 is not just about games and we now see real-world applications. In healthcare, deep learning models can perform as well as a human expert in analyzing electron microscopy or in detecting eye diseases. For the environment and climate, AI is helping to build better climate models, mapping millions of solar roofs in the US, detecting hyperspectral signatures of underwater objects to monitor ocean health & many other animal conservation works. The open source community is also contributing to interesting projects. The common theme across the applications above is the drastic improvements in computer vision (CV) and natural language processing (NLP) in 2018. Deep learning has worked very well for the ImageNet classification challenge where we improved from 26.2% error rate with SIFT (late 90s) to 15.3% error rate on AlexNet (2012) and recently to 2.25% with SE-ResNet (2017). 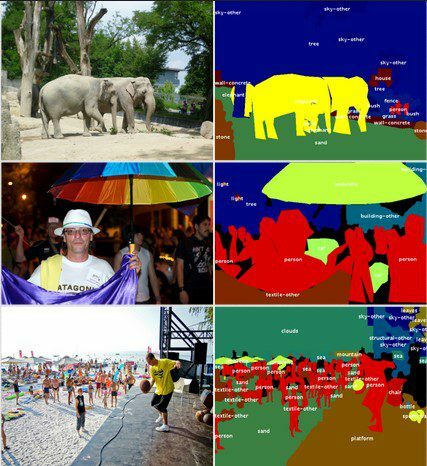 Now, object detection (pictured above), a classic problem can be handled in real time by You Only Look Once (YOLO) and its derivative models or more accurately by Single-Shot Detector (SSD). Image segmentation (pictured above) used to be a challenging problem, especially for complex images where the boundaries of objects overlap. The state of the art deep learning models like Path Aggregation Network (PANet), Context Encoding Network (EncNet) builds on many previous ideas, with an improved feature extractor and context information. Of course, we need to include BigGAN; it is like GAN, but bigger and more than 2x better than the previous state of the art in image synthesis. AI can now generate realistic fake faces, fake videos (DeepFakes) and is accurate enough to catch a criminal among a crowd of 50,000 people in the middle of a concert. 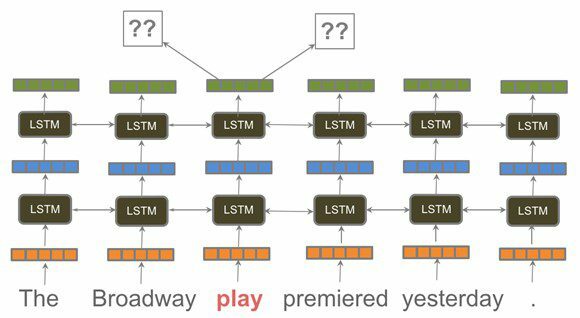 It was also a big year for NLP, beginning with Jeremy Howard and Sebastian Ruder’s ULMFiT that brought transfer learning at scale to NLP; this is a big deal, as current language models are mostly language specific. While I was working in a regional eCommerce firm in Southeast Asia, my team had to build a model to handle English, another to handle Thai, Vietnamese, Bahasa…it gets exponentially more difficult and costly as we try to cater to the linguistics of different languages. Transfer learning allows us to bring what the model learned about English into Bahasa, saving time and money. ELMo and BERT bring in the idea of context into word embeddings. In the image above, the word “play” is a noun in this particular context and carries a different meaning from “playing” or “to play” in other contexts. ELMo and BERT will be able to separate and keep track of the various meanings of the same word and is thus far more precise than the vector-based models that assign a single meaning to the word. But what does all these AI development mean? Now that there are legal AIs that can beat lawyers from top law firms, does it mean that AI will eventually replace all of us? Interestingly, the lawyers are relieved that AI can take care of the mundane, repetitive work like NDAs so that they can focus on more complex, value-adding work. Even so, AI will likely replace many mundane tasks soon and people are debating policies to help those affected by the AI future. Furthermore, we also see the rise of data privacy and AI issues with Europe’s GDPR, Cambridge Analytica & Facebook and Uber’s self-driving car crash. AI is powerful and had definitely grown in 2018; however, it is still far from maturity. We may see explosive growth in areas like IOT + AI, blockchain + AI and more in 2019; I can’t wait to see what we will create next. Bio: Kai Xin Thia works at the intersection of data science, computer science and product and loves building large and challenging data products.